Influential men decided to make South Dakota a state during an 1879 Thanksgiving Day dinner in Yankton. 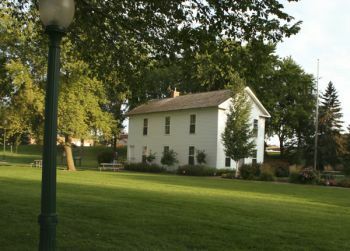 Photo of Yankton's territorial capitol replica by Andrea Maibaum. Thousands of local, state and federal problems will be “solved” by families gathered around Thanksgiving tables this month, though in reality, when the turkey’s gone, gas will still cost $3 a gallon and you may or may not be able to surf healthcare.gov. One of our most fruitful Thanksgivings happened in Yankton in 1879, when a group of influential men gathered at the home of a Congregational minister. By the end of the evening, they had resolved to divide Dakota Territory and make its southern half the newest state in America. Many historians agree that the 1879 Thanksgiving Day dinner at the Rev. Stewart Sheldon’s house served as a catalyst in the quest for South Dakota statehood. The other men gathered around his table included his brother-in-law Joseph Ward, also a Congregational minister and founder of Yankton College, territorial governor William Howard, U.S. Attorney Hugh Campbell, superintendent of public instruction General William H.H. Beadle and Edward P. Wilcox. The meeting had its origins because of a proposition quietly floating around the territory regarding school lands. Some residents believed they should be sold to a large syndicate for $2.25 per acre. School lands were near and dear to Gen. Beadle’s heart, and he firmly believed no school section should ever be sold for less than $10 an acre. All in attendance stood with Beadle, and all agreed that division of the territory and the creation of a new state government for the southern half would help prevent similar nefarious acts in the future. Beadle traveled the territory spreading the word about the importance of school lands, while Sheldon, Ward and the others carried the banner of statehood. Their hard work resulted in a delegate convention held in Canton in 1882. Ward was appointed to an executive committee that helped push a bill through the territorial legislature calling for a constitutional convention. Unfortunately Gov. Howard, their Thanksgiving Day ally, died in 1880 and was replaced by Nehemiah Ordway, whose vast interests in the northern half of the territory led him to veto the bill. Southern Dakotans were outraged and responded by sending 188 delegates to another convention at Huron in June 1883. Again, they demanded a constitutional convention to be held in Sioux Falls in September. Delegates gathered at Germania Hall drafted a constitution and presented it to the people, who approved it 12,336-6,814 in the November 1883 election. A newly appointed executive committee traveled to Washington and presented the document to Congress, but statehood was denied, despite support from Sen. Benjamin Harrison of Indiana (a close friend of Arthur Mellette, a statehood champion who worked in the territorial land office). The defeat seemed only to galvanize division proponents. Once again they pushed a constitutional convention bill through the 1885 territorial legislature, and this time they found support from newly appointed governor Gilbert Pierce. The second convention met at Germania Hall in Sioux Falls and drafted another document that was overwhelmingly approved (25,138-6,527). Sen. Harrison again introduced a bill in Congress calling for South Dakota statehood, but the Democratically-controlled House defeated it. Prospects remained slim as long as Democrats held the House, and Harrison even predicted that nothing would advance the cause until the presidential election of 1888. That’s when Harrison himself became president, and both houses of Congress fell under Republican control. Seeing the writing on the wall, Congress passed an Omnibus Bill creating South Dakota and four other states on Feb. 20, 1889, just before the new administration took office. President Grover Cleveland signed it with a quill pen made with the feather of an eagle killed in Dakota Territory. When President Harrison signed the official proclamation admitting South Dakota on Nov. 2, it came none too soon for one of statehood’s greatest champions. Joseph Ward died on Dec. 11. He was 52, and the state he worked so hard to create was just six weeks old. South Dakota began its 125th year on Nov. 2. Over 800,000 people live here today and love its prairies, lakes, mountains and rivers. For that, we owe a debt of gratitude to the men who shared ideas around the Thanksgiving table and committed themselves to creating a new and better home. Beadle was a smart guy. The school lands trust has survived more than a century, the principal is never allowed to decrease and it generates around 12 million dollars every year. Really good ideas seem to last long enough to be taken for granted.The people that fought for them are usually forgotten. Thanks, John a great history lesson and a lot I had not heard before so THANKS. Thanks for the informative article. Truly it's fitting that Mr.Ward's statue along with Beadle's should represent our state. Though younger generations may feel someone more contemporary should replace them, no one could have done for South Dakota as much as Joseph Ward did. All subsequent generations owe him the deepest debt of gratitude. Thanks for reminding us of that!